Billy M. “Bill” Lipscomb, age 85, of Gainesville, Georgia, passed away peacefully at 10:03 p.m. on Tuesday, October 3, 2017. Bill was honored in November 2014 at the Veteran’s Day Celebration at Rock Creek Park where he was a generous donor towards construction of the Korean Monument. A tree was also planted there on his 80th birthday in his honor by family, friends, and employees. Upon completing his tour of duty, Bill worked as a compositor at the Gainesville Times. In 1956, he began working at Matthews Printing Co., owned by W. Eph Matthews, his mentor and friend. He became co-owner of Matthews Printing Co. in 1967 and sole owner in 1984. Bill was a well-respected businessman and community servant, known for his generosity. He watched the printing industry evolve, but never deviated from his attention to precision, accuracy, and detail in his work. 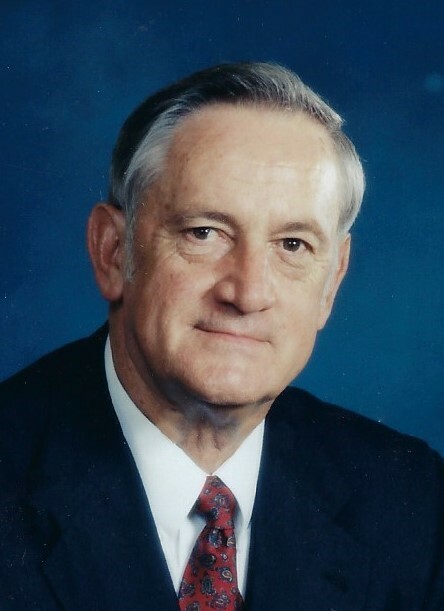 Bill was a senior active member of The Rotary Club of Gainesville and was a Paul Harris Fellow and a Will Watt Fellow. He was also a member of the American Legion for 50 years and a proud member of the Gainesville Elks Club. Bill was an avid golfer, thoroughly enjoyed the game, as well as the great friendships developed over the years. In the years Bill played golf at the Chattahoochee Country Club, he had five holes-in-one. Bill is preceded in death by his parents, Claude Smith Lipscomb and Irene Small Lipscomb as well as 2 brothers and 5 sisters. He leaves as survivors, his wife of 63 years, Martha Ramsey Lipscomb; daughters, Lesa Lipscomb Hartley and Anne Lipscomb Davenport; four grandchildren, Chris Hartley and his wife Jennifer, Erin Hartley Reyes and her husband Jonathan, Trey Davenport, and Lindsay Davenport Allison and husband AJ; nine great grandchildren; sister-in-law, Mildred Ramsey Britt and her husband J. L.; brother-in-law, John Lackey; many cousins, nieces, nephews, and friends. The family will receive friends from 4:00-7:00 p.m. on Thursday, October 5, 2017 at Little and Davenport Funeral Home. Funeral Services will be held at 11:00 a.m. Friday, October 6, 2017 in the chapel of Little & Davenport Funeral Home. Dr. Tom Smiley and Dr. Jerry Gill will officiate. Interment will follow in Memorial Park Cemetery. In lieu of flowers the family has asked that memorial contributions be made to Lakewood Baptist Church or one’s favorite charity.